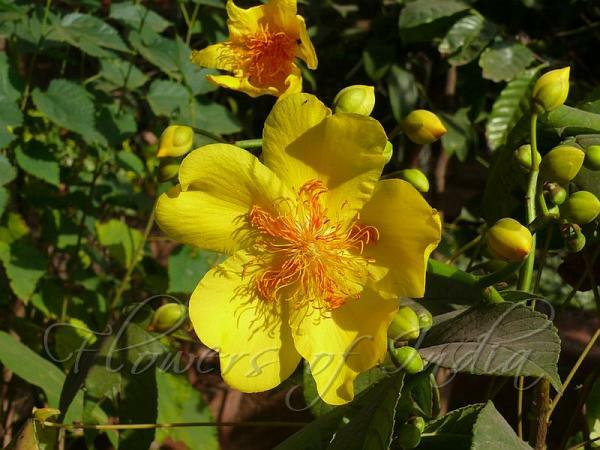 Buttercup Tree is native to India, Burma and Thailand. It is a small tree growing upto 7.5 m. The bark is smooth and pale grey. It is sparsely clothed with leaves and sheds them at the height of the flowering season. The leaves appear at the tips of the branches and are palmately lobed. 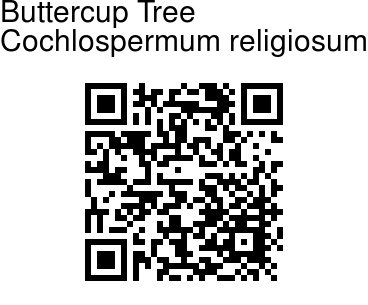 The flowers of the Buttercup tree are the most conspicuous part of the tree. They are large, growing upto about 10 cm, buttercup shaped and bright yellow. The stamens are orange. The flowering season is between February and April, particularly after the leaves are shed. The fruits are brown and oval shaped. They come in the form of a capsule made up of five segments. The capsule splits open to release the seeds which are embedded in the silky cotton contained within. This silky cotton is said to induce sleep when stuffed into pillows. The botanical name has the following meaning - Cochlospermum because the seed resembles a snail. Religiosum because the flowers are used as temple offerings. Identification credit: Pravin Kawale, Prashant More Photographed at Jijamata Udyan & Sagar Upvan, Mumbai.